Do you have a designated writing space? Do you wish you had a really awesome place just for writing? 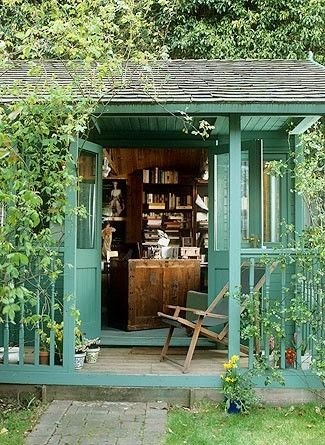 I wish I could say I write in my very own writer’s den of wonderfulness, but I don’t. Honestly, I will write anywhere, and I often do write bits and pieces in the most random of places. But the bulk of my writing takes place at home. That used to mean in our office, but now that I write mostly on my laptop, it typically means downstairs at the dining room table or while sitting on the couch. It works, and I’m happy I have a flexible machine so I can write while I’m away from home as well. But I do wish I had a beautiful place just for writing. If you could design your dream writer’s space, what would it be like? I can sort of envision two types of spaces for me. One would be in a very light and bright attic space, with an old beach-house kind of feel. White walls, tons of natural light, and a nice light wooden desk with a comfy couch or chair nearby for thinking, plotting, and reading. My other dream space is kind of the opposite. This one I see downstairs, and all dark wood. A giant dark wooden desk would be the centerpiece to the whole room, and there would a be a fireplace for cozy winter/night working. Plus, bookshelves lining all the walls, with working ladders that rolled from side-to-side, to reach the volumes up top. I found a whole Pinterest page devoted to writer spaces, and of course they are all awesome in their own way. Here is my favourite. So what about you? What would your dream writing space look like? A cozy cottage, a huge modernist space, a tropical island wholly devoted to being your place to write? Do you think you’d be more inspired in some of these fancy places? Or does the place not matter…will your creativity flow no matter where you are? I once saw a house for sale in Wellington, NZ. It was a white-washed timber house overlooking the bay, and I swore that one day I would buy that house as my writing retreat. Until then I am happy in my study. It's a shrine to NZ and Middle Earth which is as close to the real thing as I'll probably get!